West Ham manager Slaven Bilic says he is "not worried" but is "realistic" about his future after the Hammers lost 3-0 to Brighton at London Stadium. The home fans booed throughout and thousands left the ground early following Brighton's third goal, which sealed the visitors' first away win of the season. West Ham slipped to 17th in the table and will drop into the relegation zone if Leicester beat Swansea on Saturday. "The speculation was here before," said Bilic. "I'm manager of the team. I don't want to hide behind anything. It's my responsibility and it's up to the board." 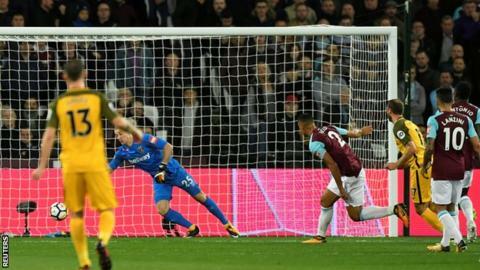 Before the game, Hammers chairman David Sullivan said you should "honour" a contract with an employee unless things were "desperate". Brighton took the lead after 10 minutes when the unmarked Glenn Murray headed in Pascal Gross' free-kick. Moments before the break Jose Izquierdo curled past Joe Hart from distance, despite the England goalkeeper getting a strong hand to the ball. Murray added his second from the penalty spot in the 75th minute after he was fouled by Pablo Zabaleta. Although they dominated possession, West Ham had only two shots on target, long-range efforts from Pedro Obiang and Manuel Lanzini. Chris Hughton's Brighton, who were brilliant throughout, climbed to 10th in the table. After losing their first three games of the season, resulting in calls for Bilic to be sacked, West Ham claimed eight points from their next five matches. However, before the Palace game, Bilic talked of possible "hurricanes" if results went badly, and he can expect to come under more scrutiny after his side's awful display. Former England midfielder and BBC Radio 5 live pundit Jermaine Jenas said the Hammers were "embarrassed" by their opponents and that the performance felt like the "final nail in the coffin" for Bilic. He added: "I felt like Slaven Bilic ran out of ideas a little bit. He looked dejected on the sideline. It felt like a tough moment." The crowd grew more restless throughout as passes were misplaced, crosses failed to find a team-mate - West Ham attempted 33 - and shots went high and wide. The marking for Murray's opening goal from 10 yards was non-existent, while Hart will be questioned for palming Izquierdo's strike into the net as he dived to his left. "He has got that much of his hand on the ball that he has got to save it," said Jenas. Bilic, who was appointed West Ham manager in June 2015, apologised to fans and said they "deserve better". After steering the club to seventh in the Premier League in his first campaign in charge, West Ham struggled to adapt to their new stadium the following season. They won only two of the first seven league home games after moving from Upton Park - they lost 4-2 to Watford, 3-0 to Southampton and 5-1 to Arsenal - but recovered to finish 11th. "We've been here before and we managed to turn it around," said 49-year-old Bilic. "I'm not worried - worried is a bad word. I am strong and all that and on the other hand it's not a question for me about my future. "I know what I feel. I can't say everything publicly. I've tried my best but when you lose 3-0 at home to Brighton I wouldn't be surprised with anything." Chairman Sullivan said he "believed in what's right" but did add that a change of manager "can give you two or three more points" in a season. "The manager has a three-year contract and is entitled to these three years," he said. "After the season we will sit down and see if he wants to stay on and if we want him to stay on. That's a long way off." Victory for Brighton - their first on the road in the top flight since 1983 - resulted in jubilant scenes at the final whistle. However poor West Ham were, Brighton defended resolutely and were impressive in attack. They scored three goals from seven attempts - West Ham had 16 efforts - and could have added further misery to their hosts as Murray had two good chances saved by Hart. Brighton centre-backs Shane Duffy and Lewis Dunk were excellent, making 11 clearances each to ensure goalkeeper Mat Ryan was hardly tested. Victory was Hughton's first away from home in the Premier League since November 2013, ending a run of 12 matches without a win. Brighton manager Chris Hughton: "We were outstanding against a team who have got real quality. They threw a lot at us - a lot of crosses and blocked shots. "We were good with the ball and gave ourselves a good platform to create chances. Apart from the goals, Glenn Murray had the best chances of the game. "This is massive for us. Our first home win was big for us but what we have learnt is that we play at our level we can compete." Brighton recorded their joint-biggest away top-flight win, equalling their 3-0 victory at Crystal Palace in April 1981. This was West Ham's heaviest home league defeat against a newly promoted side since losing 5-1 to West Bromwich Albion in November 1931. Pascal Gross has assisted four goals in his first nine Premier League matches. Of players to have played their first nine games for a newly promoted side, no player has more (level with Tommy Wright, Wayne Routledge, Adam Lallana and Jobi McAnuff). Since Slaven Bilic took charge of West Ham, the Hammers have conceded 18 penalties in the Premier League, four more than any other side. Glenn Murray has twice scored two goals in a Premier League game - both against West Ham (he scored twice for Crystal Palace in February 2015). West Ham have conceded more headed goals than any other Premier League side this season (5). They conceded four headed goals in Slaven Bilic's first season in charge in 2015-16. No side has conceded more set-piece goals in the Premier League this season than the Hammers (6, level with Watford). West Ham travel to Tottenham in the EFL Cup fourth round on Wednesday (20:00 BST) before returning to Premier League action on Saturday, 28 October at Crystal Palace (15:00 BST). Brighton host Southampton in the league on Sunday, 29 October (13:30). Match ends, West Ham United 0, Brighton and Hove Albion 3. Second Half ends, West Ham United 0, Brighton and Hove Albion 3. Offside, West Ham United. André Ayew tries a through ball, but Chicharito is caught offside. Delay in match Winston Reid (West Ham United) because of an injury. Attempt saved. Manuel Lanzini (West Ham United) right footed shot from outside the box is saved in the centre of the goal. Assisted by Edimilson Fernandes. Attempt blocked. Michail Antonio (West Ham United) right footed shot from outside the box is blocked. Assisted by Arthur Masuaku. Substitution, Brighton and Hove Albion. Ezequiel Schelotto replaces Anthony Knockaert. Attempt missed. André Ayew (West Ham United) header from the centre of the box misses to the right. Assisted by Pablo Zabaleta with a cross. Corner, Brighton and Hove Albion. Conceded by José Fonte. Attempt blocked. Solly March (Brighton and Hove Albion) left footed shot from outside the box is blocked. Attempt blocked. Manuel Lanzini (West Ham United) right footed shot from the centre of the box is blocked. Substitution, Brighton and Hove Albion. Isaiah Brown replaces Pascal Groß. Goal! West Ham United 0, Brighton and Hove Albion 3. Glenn Murray (Brighton and Hove Albion) converts the penalty with a right footed shot to the centre of the goal. Penalty conceded by Pablo Zabaleta (West Ham United) after a foul in the penalty area. Penalty Brighton and Hove Albion. Glenn Murray draws a foul in the penalty area. Substitution, West Ham United. Edimilson Fernandes replaces Marko Arnautovic. Attempt saved. Glenn Murray (Brighton and Hove Albion) right footed shot from the right side of the six yard box is saved in the bottom right corner. Assisted by Anthony Knockaert with a through ball. Corner, West Ham United. Conceded by Gaëtan Bong. Attempt blocked. Marko Arnautovic (West Ham United) header from the centre of the box is blocked. Assisted by André Ayew. Attempt missed. Manuel Lanzini (West Ham United) right footed shot from outside the box is too high from a direct free kick. Winston Reid (West Ham United) wins a free kick on the left wing.